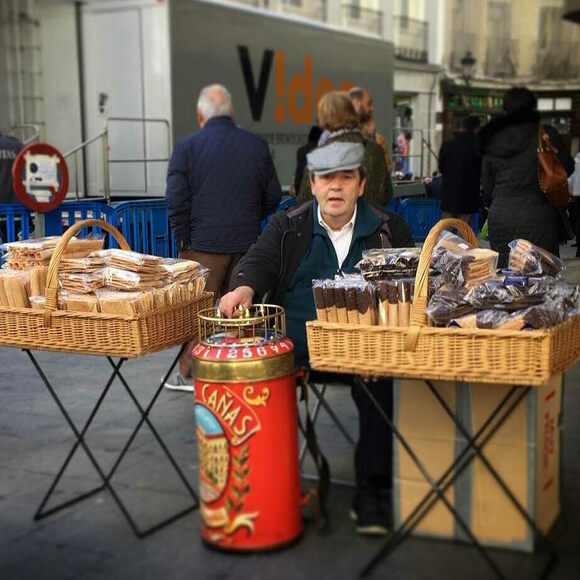 For decades, men and women have wandered Madrid’s streets selling their barquillos. The barquillos are simply waffle-like dough pressed flat into a checked pattern, then rolled into tubes, cones, or other shapes. But the barquillero’s sales ritual elevates the treat into something truly special. When you encounter a barquillero, the vendor will take a massive red tin off his back and engage you in a game of roulette using a wheel at its top. You can pay once to spin for either one or two barquillos or pay more and spin as many times as you want, racking up waffles until you stop or the ticker lands on one of the four golden markers, at which point you lose everything. The barquillo was almost brought to extinction by food shortages during Francisco Franco’s dictatorship. Luckily, the Cañas family of Madrid persisted in carrying on the barquilleros’ legacy. Today, Julian Cañas, a third-generation barquillero, maintains a shop in the city’s Embajadores neighborhood that continues to sell the treat. On weekends, Cañas and his sons also roam Madrid’s plazas and parks with baskets of waffles under their arms and roulette-tins on their backs. Today, you can try several varieties of barquillos dusted with cinnamon or vanilla and covered or stuffed with chocolate and other flavors. Because of their similarity to the waffle cones used with ice cream, they’re frequently sold with frozen treats or in one of the many pastry shops that can be found throughout Madrid. For the most authentic experience, however, look for a barquillero in public spaces such as the Plaza Mayor, El Rastro market, or Retiro Park. The roaming, gambling vendors also make appearances at summer festivals, such as the San Isidro Festival. If you want fresh barquillos, you can usually find them only on weekends or at special festivals. Otherwise, you’ll have to stock up at a local pastry or ice cream shop. After his family kept the tradition of barquilleros alive, Julian Cañas continues to sell the waffle treat from this bake shop. Barquilleros are known to set up shop in this plaza over the weekend. A popular flea market held every Sunday.